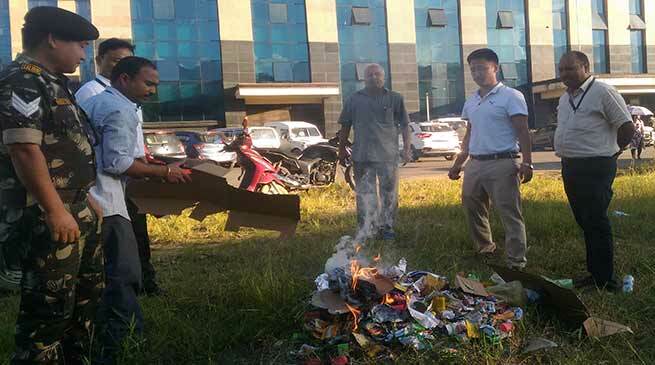 The Arunachal Pradesh Civil Secretariat today in an awareness drive disposed off several packets of cigarette and other tobacco product after an order from AP Secretariat Administration. Under Secretary ( Cooperation) C Remasan, who was present while said that state government vide its order dated February 13, 2017 about maintenance of cleanness, hygiene and prohibited spiting on walls, litter and spoil office premise show ugly while prohibiting of use of tobacco products. He said that inspite of circular in all branches it have been observed that hundreds packets of tobacco products have been seized on several occasion and is being disposed off today while warning is being issued and appeal all the employee to adhere to the order of the government in maintaining cleanness drive. Assistant Security officers, Tatu Ronya said that carrying of arm in the campus is also banned and so far we have seized 10 small arms which have been forwarded to the Police Station and appeal all those who have any works in AP Civil Secretariat not to carry any arms and ammunition in the Secretariat to avoid inconvenience. Other officers present during the occasion also appeal all officers and officials of the AP Sect not to use tobacco product in the campus and said that tobacco kills.